The Parrish Art Museum in Water Mill is embarking this weekend on a three-month long exhibition exploring the most watery parts of this world. 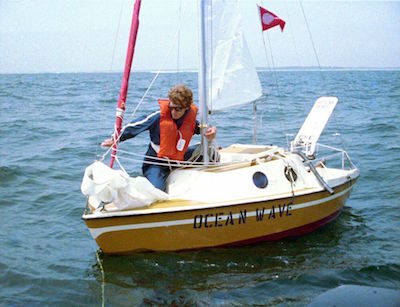 “Radical Seafaring” explores the growing number of works created on the water, and with water as a theme, by contemporary artists whose work engages the questions surrounding a changing natural world. The exhibit, curated by the Parrish’s Curator of Special Projects, Andrea Grover, features 25 artists whose works range from artist-made vessels to documentation of creative expeditions to speculative designs for alternative communities on the water. 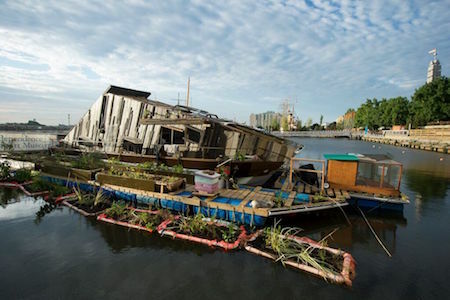 The multidisciplinary exhibition includes a 152-page catalog, two-dimensional works, sculpture, vessels, models, film and video, off-site commissions and boat trips around East End waterways. 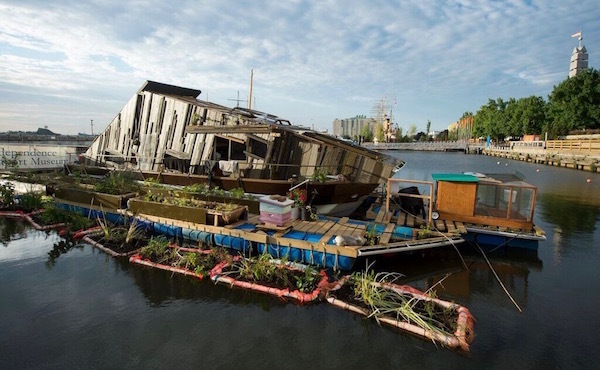 As part of the exhibit, ecological artist Mary Mattingly will dock a modified houseboat named WetLand on Long Wharf in Sag Harbor on May 9. WetLand demonstrates easy-to-do sustainability projects like solar power, rain water collection and purification, vegetable gardening, upcycling, and describes the impact each individual can have on the environment. WetLand will be open to the public Saturdays through Mondays from noon to 5 p.m. through May 22. The Parrish will also be holding a day-long series of talks and performances with artists, writers, scientists, and historians discussing environmental stewardship with a focus on the regional landscape. The series, titled Tideland Sessions, will be held May 21 from 11 a.m. to 8 p.m. Tickets are $10. The museum will also host a staged reading of Men’s Lives by playwright Joe Pintauro, based on Peter Matthiessen’s nonfiction book about the East End’s fishing community, on June 17 at 6 p.m. The reading, produced and directed by Emma Walton Hamilton and Stephen Hamilton, celebrates the 25th anniversary of the play. Tickets are $10 and are available online here. The exhibition at the Parrish Art Museum, opening this Sunday, May 8 and running through July 24, begins with the conceptual and performance art of the 1960s and 70s and continues through recent phenomenological research and site-specific works — relocating the studio, the laboratory, or the performance space to the water. The exhibition is divided into four themes: Exploration (the quest for new experiences, the ineffable, and living in an exhilarated state),Liberation (self-reliance, freedom from terrestrial social contracts, the desire to shape one’s world, and Utopian impulses), Fieldwork (hands-on, methodological intelligence gathering about the environment, such as an artist laboratory at sea), and Speculation (waterways as a tabula rasa on which other realities can be built). 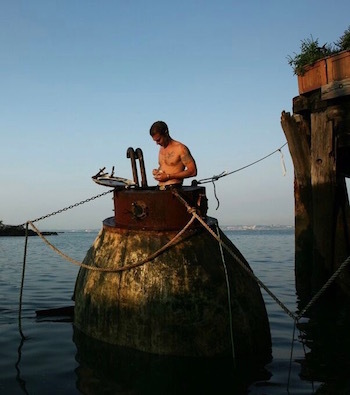 The works in Radical Seafaring represent a form of expression that is powerful and timely, as climatologists anticipate the effects of rising sea levels, changes in weather patterns, and the impact on coastal zones when half the world’s population lives within 200 miles of a sea coast. The artists featured in Radical Seafaring figure prominently at the center of a universal inquiry: how do we live in a natural world from which we are detached, not only physically but emotionally and intellectually. Artists in the exhibition include Bas Jan Ader, Ant Farm, Atelier Van Lieshout, Scott Bluedorn, George Brecht, Bruce High Quality Foundation, Chris Burden, The Center for Land Use Interpretation, Steve Badgett and Chris Taylor, Michael Combs, Mark Dion, R. Buckminster Fuller, Cesar Harada, Constance Hockaday, Courtney M. Leonard, Mare Liberum, Marie Lorenz, Mary Mattingly, Vik Muniz, Dennis Oppenheim, The PLAY, Pedro Reyes, Duke Riley, Robert Smithson, Simon Starling, and Swoon. The Exhibition Catalogue, “Radical Seafaring,” will be distributed worldwide by DelMonico Books. Parrish Art Museum Members are invited to join us for a special opening reception on Sunday, May 8, from 11am to 1pm. Members can reserve online or call 631.283.2118 x181.